We are thrilled to bring you a brand new mystery game. IMPORTANT: For our returning players at the convention, take note that the mystery game is on FRIDAY, not Saturday. The game starts at 12:30 with ballots due before 5:00 and the finale at 5:30. We are in room 2207 (the gaming floor). New mystery at CONvergence 2015! Bakken Mystery Game and CONvergence! Happy Spring to all our fellow lovers of steampunk and mysteries! 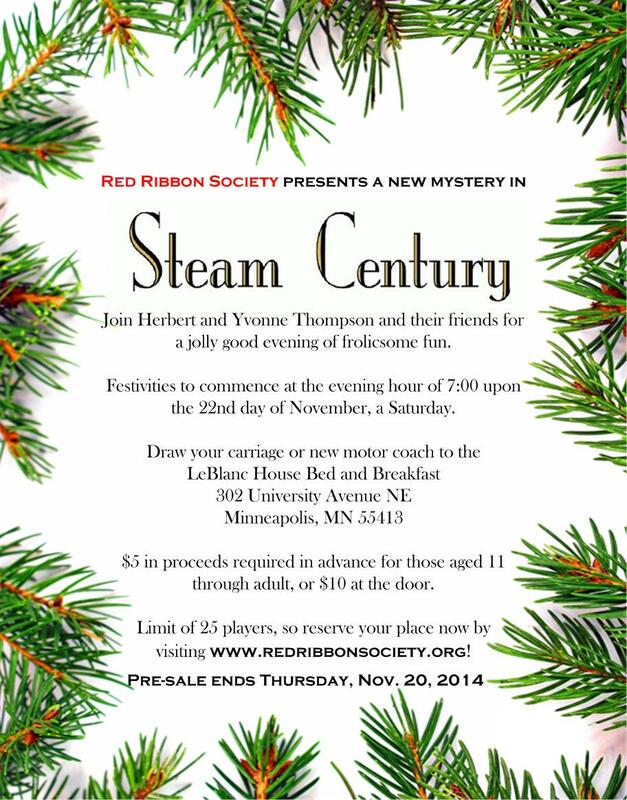 The Red Ribbon Society is busy at work on two upcoming events. Bakken Mystery Game Thursday, May 28 at 5:30 p.m.
Bernard Singleton knows his family is in danger, but needs your help to find out who is after them! Follow the clues by talking to suspects throughout the museum, including suspicious servants, visiting relatives, and some very curious out of town guests. We are very excited about partnering with them to create a new mystery for their member event. This is normally a Bakken member-only benefit, but they have graciously opened attendance to our great players. The Bakken Museum is a 501(c)(3) charitable organization, so memberships are tax deductible. Have fun at a new mystery game and show your support for the Red Ribbon Society and The Bakken Museum by attending on May 28th at 5:30 p.m., and make it even better by joining The Bakken Museum. Family Science Night – Mystery at The Bakken is a private Bakken Museum Event, free to Bakken members and active volunteers. Red Ribbon Society patrons may attend this special event by paying the regular admission price of $7, or by a purchasing a membership at a special one-time 10% discount at the event. Those wishing to attend must RSVP by Thursday, May 21 by sending an email to Phil Borreson at borreson@thebakken.org. We’re off to the CONvergence Convention happening July 2-5. 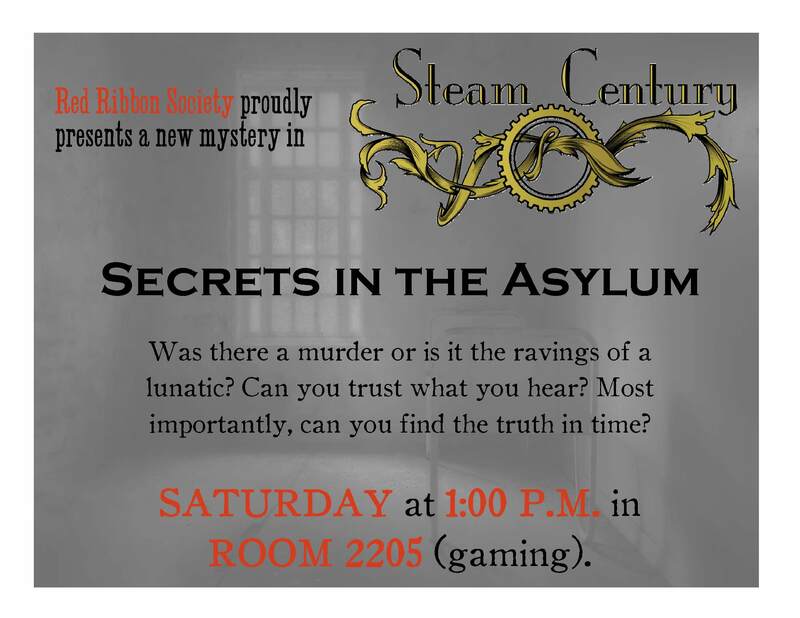 On tap we have a new Steam Century mystery game on Saturday starting at 12:30. Kaposia is shocked by the murder of three women. Can you solve the mystery before the serial killer strikes again, or is something even more sinister at work? Our Steampunk Craft Hour returns Sunday morning from 11:00 to noon in the Quantum Sandbox. People’s favorite Steam Century Scavenger Hunt is back for a double dose of fun both Friday and Saturday nights. We hope to see you at our events. Minnesota Public Radio at the November Mystery Event! The Red Ribbon Society, a nonprofit and all-volunteer organization devoted to steampunk, hosts regular mystery events — murder mystery parties set in the Victorian era with a steampunk backdrop. Players interact with cast members from the Red Ribbon Society to solve the mystery. Photojournalist Yi-Chin Lee joined the party as Kevin Borchers, president of the society, describes steampunk and the game. 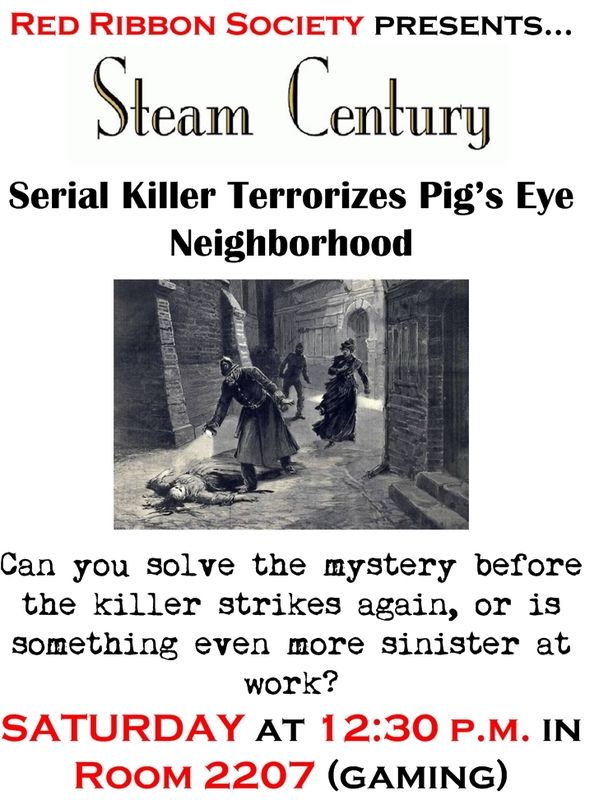 Steam Century has a new fabulous and fun mystery game! Players will read the daily paper for information, move through the house, gather clues, and interview characters to solve the mystery. Players are welcome to come in costume or in pajamas, as a character or as themselves; anything goes!